If you’ve ever eaten hummus then chances are you’ve eaten Tahini as its a key ingredient in Tahini that gives it that distinctive flavour. 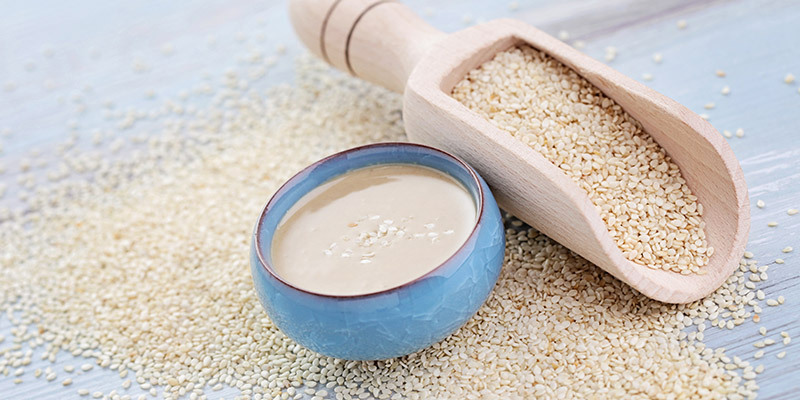 Tahini is basically a sesame seed paste that’s similar to a nut butter but thinner in texture and more subtle in flavor. Tahini is a key ingredient in the classic chickpea dip but that doesn’t mean you should limit it to hummus, as it is spectacular in a broad range of dishes. Tahini is excellent in other dips too like avocado, and with a few tweaks makes an excellent sauce for vegetables. If you are looking for a dairy-free alternative to give a rich, buttery flavor then Tahini has the answer. It not only works well in savory dishes but also in sweet biscuits and nibbles – scroll down to find out how. Before we delve into the many ways you can use it, how about the benefits? Tahini contains arguably the highest concentration of calcium. In just 35 grams of tahini, you could get about 35% of your recommended daily intake of calcium. Which means you will get more calcium than a glass of milk. It is also a rich source of health-boosting B vitamins and vitamin E as well as having high concentrations of essential minerals such as magnesium, potassium, iron, phosphorus, and lecithin. More importantly due to its preparation as a paste and its high alkaline content, the nutritional benefits of Tahini are easily digested and absorbed. In your Hummus of course. As a sauce for veggies: Place half a cup of tahini in a large bowl and add the juice of half a lemon, a teaspoon of crushed garlic, salt, pepper and a pinch of cumin. Then keep adding cold water in a trickle and beat with a balloon whisk or fork until you get the consistency of a white sauce you can drizzle. You will see the sauce seize up a little at first and then relax as you add more water. This sauce goes with almost any veg and is fantastic with chicken or fish, or even as a salad dressing. Whisk the flour, baking powder, baking soda, and salt together in a small bowl; set aside. Cream the butter, tahini, and coconut sugar together in a stand mixer fitted with the paddle attachment on medium speed until light and fluffy, about 3 minutes. Add the egg, return the mixer to medium speed, and mix until completely incorporated. Stop the mixer and scrape down the sides and the paddle. Return the mixer to low speed and slowly add the flour. Stop the mixer when almost all the flour is incorporated, then use a rubber spatula to incorporate the last of it by hand. Cover with plastic wrap and refrigerate until it starts to firm up 1 to 1 1/2 hours. Arrange a rack in the middle of the oven and heat to 180°C. Line 3 baking sheets with parchment paper. If you don’t have 3, you can reuse baking sheets and parchment, just let the baking sheet cool completely between uses. Place the coarse sugar in a shallow, wide bowl or pie plate. Scoop the dough by level tablespoons and roll into balls. Roll each ball in the sugar to lightly coat. Place the dough balls on the baking sheets 2 inches apart, 12 per baking sheet. Using the back of a fork, flatten each cookie to about 1/2-inch thick with a criss-cross pattern. Bake one sheet at a time until the cookies are a light golden-brown around the edges and on the bottoms, 12 to 14 minutes. Let cool for 2 minutes on the baking sheet, then transfer to a wire rack to cool completely. Store in an airtight container at room temperature for up to 5 days.